Parallel Lines in a QuadrilateralÁèêÞ What is this about? ABCD is a quadrilateral. The line through A parallel to CD meets BD at E and the line through D parallel to AB meets AC at F. Prove that EF is parallel to BC. If AB||CD there is nothing to prove since, in this case, E coincides with B and F with C. Otherwise, let M be the intersection of AE and DF and G, H the intersections of EF with AB and CD, respectively. First consider the trapezoid AMCD. (1) DH/FH = EM/EF, or DH/EM = FH/EF. (3) DH/EM = FH/EF = CH/AE, or DH/CH = EM/AE. Two transversals GH and BC induce equal ratios on sides BD and CD of angle BDC. The transversals are parallel. Michel Cabart came up with a shorter variant of the proof. Let I be the intersection of BD and AC. Let g be the homothety with center I mapping BA onto DF, h the homothety with center I mapping DC into EA. Let f the homothety product f = gh. Since homotheties with a common center commute, we also have f = hg. implying f(BC) = EF so that EF is parallel to BC. with the same conclusion as before. Michel's third message read: "My last remark about this problem. The plain reason why this figure looks so familiar is that it is nothing else than Pappus configuration." You may want to ponder this one before reading further. Just brilliant. Let ab, cd, and bc be the points at infinity defined by the directions of AB, CD, and BC, respectively. Instead of the quadrilateral ABCD, consider the hexagon BAabCDcd. E is then the intersection of Acd and CD, while F is the intersection of AC and Dab. Let K be the intersection of the third (Pappus) pair, viz., BC and (ab)(cd). 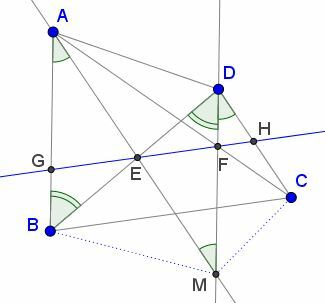 By Pappus' theorem, the three points E, F, K are collinear. But K belongs to the line at infinity (ab)(cd), implying that EF is indeed parallel to BC. Note there is another set of parallel lines in a quadrilateral.